Open data is difficult to explain with words alone. A visualization combined with citizen delegations will give Councillors a full picture of what Open Data means and why they need to embrace it. Do you want to see what the election results look like poll by poll? Are you interested in learning how to participate in making Hamilton an Open Data City? Do you want to be more informed? Are you interested in contributing your skills online? 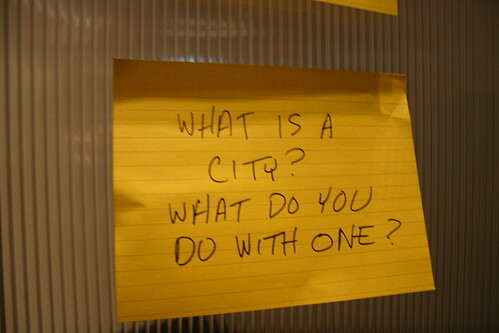 If you answered yes to any of these questions, join us this Saturday, 11:00 AM, at the Mulberry Cafe, James Street North and Mulberry Street, as we take the next step towards making Hamilton an Open Data city. Everyone can contribute. You don't have to be a web programmer or computer nerd. Open Data is the philosophy and practice of providing public data in an accessible electronic format that is free from copyright, patents, and other restrictions. The principles of open government data are best summarized in the Eight Principles of Open Government Data developed by the Open Government Working Group. Transferring electoral data into an open format and using that data to visualize the results will show City Councillors and the Mayor what's possible by allowing citizens to access public information in real-time. By using data that's of interest to both the entire general public and especially elected officials, we significant increase our chances of getting City Council to pass a strong motion adopting an actual Open Data policy. What can we do with these maps? The City of Hamilton's voting location application did not include many addresses. The limitation was it didn't use geographic data to calculate voting location - it used an old table not much different than a paper telephone directory. We can use our maps to provide the City a comprehensive voting location application that operates on every platform. It was disgraceful not to have any electoral data in mobile format in 2010. To think the City will continue using an outdated table on an outdated website in 2014 leaves me without the words. Getting access to the data from the City's electronic voting system in Council Chambers and have a record of every single vote taken by Council. Imagine knowing where your Councillor stood on any issue. On the Internet, Council could be streamed with live voting results provided on the same webpage. You want to know how Council votes on a decision but don't have access to cable or the Internet? You can sign up for mobile text message alerts for every vote, or just the vote you're most interested in. Let's stop imagining and make it happen. December 1 is only a month away. This article was first published on Joey Coleman's website. Who do you need to get buy-in from within the city? Do you "aim high" and get council to force it through, or do you start at the bottom and work up to council? What's the value proposition for each group you're selling the idea to? How do you assuage the fears (real or imagined) that some may have to making such information more freely available? All good questions, paulhart. I took a stab at answering some of them in an article last year. Unless some don't know regarding the HSR thing, Google implemented something similar. If you use Google Maps or Google Earth and zoom in pretty close you'll see all the bus stop locations for every HSR route in the city. If you click the stop, you get all the next bus times at that stop in whatever direction, for each route serving it. The information is not real-time, per se. It is pulled from the HSR's schedule information, but the buses use their GPS system to tell the driver how fast or slow they should drive to stay on schedule. So, barring any inconveniences, the HSR buses religiously follow the schedule, making the Google stops in relative real-time. Google also implemented a similar system for GO Transit and the TTC. It doesn't pull real-time GPS information in those cases either, but I'm pretty sure both systems also use GPS to keep the buses on-time, so it's fairly accurate. You can also do trip planning which will give you driving/transit/walking directions as necessary. It's really nifty and a lot more user friendly than the HSR's trip planner. turbo: just because you're not interested in this idea doesn't mean others aren't. You sound like a megalomaniac, demanding every article suit your precious sensitivities. Anyway, I'm interested but clearly a cultural change is needed, as Ryan points out in his article. The city, like most organizations, sees no benefit from sharing information, and perhaps that's because ideas for change often seem high on techno-jargon and low on useful ideas. I think this will only take place if the city manager determines it's a priority and allocates resources towards it. Perhaps the clerk's office could be amalgamated into an office of information management, with a much larger mandate than the current 'information services', which looks like one of those understaffed outfits that mostly keeps the intranet running and manages electronic records. Or they implement a variety of institution-centric projects like http://map.hamilton.ca/. Without that change you're left with very little. For instance, your idea of tracking the voting records. Maybe with a bit of creativity you'd be able to link it to the meeting minutes. However, as it stands these minutes tell you almost nothing about a meeting. In this respect Don McLean accomplishes what an entire city department should be doing - recording minutes and votes, transcribing important sessions, publishing the results. This isn't the savvy techno future you're describing, but it seems to me to be the essence of 'open data'. It's crazy the city doesn't do this itself. Apparently councillors are always asking Don what they said about a certain vote, because no one else is keeping track. The Clerk's purpose is administrative, meant to satisfy institutional requirements of 'accountability' and legal requirements, but it is functionally useless for anyone else. And as long as we're left to rely on citizen heroes to do this stuff I'm worried these ideas are nonstarters. You mention streaming meetings; that would be amazing. I emailed the Clerk and they told me they were 'looking into it but have no specific date'. ie it's never going to happen. On the upside, I really think the city could be persuaded to see the value of this, but that value needs to be described in a way that the city benefits from it as well as residents. According to Wikipedia, "worldwide IT services revenue totaled $763 billion in 2009". Why are billions spent on information technology? Because information is valuable. Why is it valuable? Because it assists with creating knowledge and making decisions. If we can produce something of great value, without great expense, that assists with creating knowledge and making decisions at the level of local government, why wouldn't we? Agreed 763 billion times over, Adrian. We need to open up policy data to people, not just the conclusions and recommendations of city managers. We need to stop pretending that gatekeepers charging for access to knowledge are really doing the public a service. The first step to better decision making is more eyes pouring over the data. Freedom of Information is about more than being able to submit a form, pay a charge, and wait indefinitely. Yep, saw the advertisement on Facebook to come one down from 11 a.m.- 9 p.m. Figured oh "its an open house affair where the public can come and discuss and find out more about what this group is trying to do to improve our political process. Got there about an hour after started. The group were engaged in a circle giving their criterion on how Bob the new mayor handled the media. I personally think he handled them just fine!! Did I get anything from this meeting? No. My questions were regarded as inconsequential!! The attitude was elitism. I personally felt very excluded from this important catalyst for change in our city. I am for this city to have open accessibility , transparency and accountiblilty. Welcoming people to learn about this is much needed in our community.. Making a subcultural elite group mmmmm is well boring - not my cup of tea. Thanks for the invite I hope people didnt show up after you left at 1 - yet advertised until 9 p.m. I did come away with one positive thing, something I strive to always look for in whatever and wherever I go. One gentlemen spoke, after he was rudely cut off, about what I thought this meeting was supposed to be all about, "the barriers our current election process has in reaching out to the public in an effort too engage them in the political process and ensure and implement computer technology that will help to make politians accountable and transparent.. This is the site he recommended.. enjoy! The meeting went very well. I did make the mistake of putting too much time on the Facebook event. In terms of progress, we made plenty. There are more people involved in the push to have Open Government, Open Data in Hamilton. While this comment is anonymous, I can infer from the statement "after he was rudely cut off" and the late arrival that the disconnect here is that you felt this meeting was a forum to bring up your theories about the electoral counting at City Hall. When some of your statements about a conspiracy among the incumbents were proven wrong, you became frustrated with the discussion. Every effort was made to find a method of involving you, but you choose not to discuss the topic at hand. Having different goals than you does not make a group of people "elitist." First and foremost. The advertisment for this meeting, did not give real specifics what it entailed. I envisioned a display of information, particuarily when it was scheduled from what 11 - 9 p.m. In that forum a display of what Google Earth, Cello GPS looked like.. to inform people of the possiblilties of the technology avail to them on the internet to find information, to correlate information to better understand the elections. When I entered the circle, it took me a minute or two to be brought up too snuff what you all were talking about. The essence of the conversation had nothing to do with why I was there. Having a keen interest in our Hamilton, I engaged politely in such a conversation. Bottom line.. I am a Hamiltonian... through and through..I was raised as a daughter of the Hammer. I came there to learn. I was dissappointed but not discourgaged. Avanced polls are not helping improve our political process, it is just making it uglier than it already is.